Come Home to the Quality of Pfaff Builders, Inc.
For over 45 years, Pfaff Builders, Inc., has provided top-quality, custom home construction, renovation, remodeling, and expansions in central Maryland, especially Baltimore County, Carroll County, Frederick County, and Howard County. Pfaff Builders Inc., builds quality custom homes, renovations, expansions, remodeling, and updates that are built to our superior standards and make all of our clients’ dreams a reality. John Pfaff, president of Pfaff Builders, personally works with clients in every phase of construction and renovation, advising and reassuring them so that all of our homeowners come away with a truly memorable building experience. Quality products, expert craftsmanship, personal attention, and peace-of-mind have made Pfaff Builders, Inc., the outstanding custom home builder that you will want to choose for your building project. John Pfaff founded Pfaff Builders, Inc., over 40 years ago in Carroll County, Maryland. John has resided in Carroll/Frederick County for 40 years. John’s two sons, Kirk and Brian, are actively involved in the company business. Many of Pfaff’s employees have been with the company for 20 years or longer. It is not surprising that with that kind of experience you get skilled individuals who are familiar with all areas of the building process. It is easy to see why Pfaff Builders, Inc., was awarded “Outstanding New Home” in 2000. Pfaff Builders holds a Maryland Home Improvement Contractor’s license (#11642) and a Maryland Home Builders Registration (#7083). Pfaff Builders is a member in good standing of the Better Business Bureau, the National Association of Home Builders, and the Homebuilders Association of Maryland. John oversees each project personally. Sons Kirk and Brian Pfaff supervise and manage the in-house framing crew. Pfaff Builders, Inc., employs its own masonry crew and most of the sub-contractors have worked regularly with John for his entire career. This familiarity and allegiance produces tight quality control and a high degree of excellence in every Pfaff Builders, Inc., building project. Pfaff Builders, Inc., believes in providing high quality, earth-friendly, and value-priced construction, excellent craftsmanship, careful oversight, and most importantly, a final product that meets or exceeds the needs and wants of each client. Supporting various Carroll County community organizations has always been very important to Pfaff Builders. Pfaff is a yearly purchaser at the Carroll County 4-H Livestock Auction, an annual contributor to the Newspapers in Education Program, and a sponsor of the Warriors Wrestling Program, among other causes. In 2006, Pfaff Builders donated all the labor involved to complete an addition to the home of a family in Sykesville who takes in foster children. The addition to their home will allow them to house more foster children in the future. Pfaff Builders will custom build your new home on your lot or on one of the lots in our desirable developments. 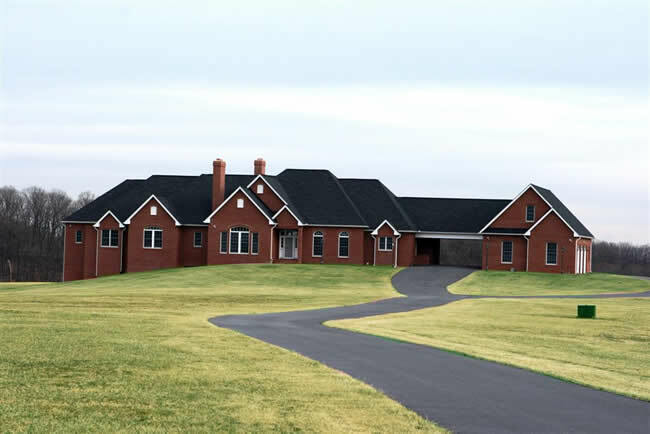 Pfaff Builders, Inc., offers some of the most beautiful sites in Carroll County for their developments. Enjoy community living in a spectacular country setting! Located near Finksburg, Maryland, Chenopodium Acres is named for the wormseed oil – “chenopodium ambrosioides” – that was grown in the Carroll County area in the early 1920s. Chenopodium Acres offers a beautiful country-like setting where 13 distinct quality custom homes will be built. All lots are 1+ acres and include well and septic. An impressive community built by Pfaff Builders, Inc., Doves Crest is situated on gently rolling countryside in Westminster, Maryland, and boasts custom homes of enduring beauty, high quality, and exceptional value. Doves Crest will have 32 homesites at its completion. All lots are 1+ acres and include well and septic. NOW is a great time to re-invest in your home. Take advantage of low interest rates to renovate, upgrade, or expand. Pfaff Builders provides top-quality construction for: Additions and Renovations; Basement, Bathroom, and Kitchen Remodeling; Decks; In-Law Suites; Apartments; and Handicapped Accommodations. We also build garages, pool houses, and children’s play houses, and even restore your old barn. While nearly all renovation projects cause some level of disruption in your household, Pfaff Builders works hard to keep it manageable. We protect unaffected areas from dust and dirt, we take precautions to keep your house secure and your family safe, and we protect the inside of your home from bad weather. You will feel at home working with Pfaff Builders. We have spent over 30 years pleasing central Maryland clients. Our honest, careful approach and hard work ethic ensure your satisfaction and peace-of-mind from start to finish. Building a home on your lot or our lot availability? Building a home in Doves Crest or Chenopodium Acres? Renovating or expanding your existing home? Other building projects, such as basement, bathroom, and kitchen remodeling; decks; in-law suites; apartments; garages; handicapped accommodations; and barn restorations? Or, do you have other questions?